the Rock 7 has the solidity and neutrality of mastertape sound to a startling extent... The price is modest, indeed, by high-end standards, but the sonic results are spectacular. Townshend combines a love of music with tried and tested engineering theory. They exploit new, previously untried, processes to create sound reproduction that constantly amazes even the most hard-bitten audiophiles. Townshend products are hand-built by skilled craftsmen in the UK, each material and technical process is chosen to ensure durability, reliability and sound excellence. Townshend high-end turntables showcase these qualities. We love it when music, analog and excellent engineering come together. Wes Bender Studio NYC is pleased to offer the Towshend Rock 7 Turntable. Come give the Rock 7 a spin and a listen at WBSNYC. Townshend Audio developed the The Rock and Rock Reference high-end turntables with the unique Excalibur tonearms. With outstanding quality and limited production, these remain highly sought after by audiophiles around the world. Townshend's damping trough & cartridge outrigger assemblyTownshend presents The Rock 7 against this well-pedigreed backdrop. The Townshend Rock 7 is an open-style record player which incorporates all the engineering and functional features of the venerable Townshend Rock V at a considerably lower cost. The Rock 7 is built with room to grow. It is supplied without the familiar front-end damping trough characteristic of all Townshend Rock turntables to date. But you can add the trough and outrigger/paddle together as an optional extra, which will transform the turntable to performance levels approaching the Rock V and surpassing most conventional turntables, regardless of cost. The turntable is supplied without a tonearm, but with the armbase of your choice. Armbases for most popular tonearms are available “off the shelf”. Others are available to special order. We've got the Townshend Rock 7 setup and tuned-up. See it, hear it at WBSNYC. 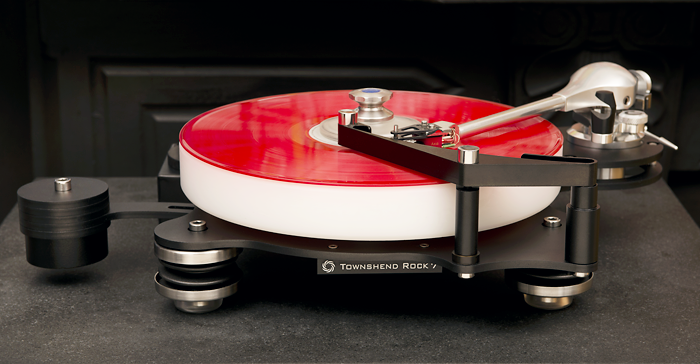 As many reviewers, including those below attest, Townsend's Rock 7 Turntable is an engineering success not only for its performance, but also for its price. I went to the Wes Bender Studio NYC to play a few LPs on the Rock 7, and came away shaken and stirred by the experience. the sound was closer to what I'd expect to hear from an open-reel tape than an old record. The Rock 7 unleashes more get-up-and-go from the grooves. Bender's hi-fi system also featured the extraordinary Hansen Prince E speakers, Zesto Audio preamplifiers, and a Viola Labs Symphony stereo power amplifier. I love my job. Arm – plates available for all radial arms from 200 mm – 255 mm (7.8 inches to 10 inches) axis to axis. Hardened precision ground steel shaft, 8 mm steel ball.